You are here: Home / Audio Programs / Leadership Programs / What Is A Leader? Comments Off on What Is A Leader? What does it take to be a transformational leader? What qualities do the most influential people of our time share? And how can you adopt those qualities to infuse transformational leadership into your own sphere of influence? Leadership is a choice, and being a good leader is a skill that anyone can learn. In this compelling program, you’ll discover the common traits of exceptional leaders in the modern era. You’ll learn a 7 step system to structure your daily actions, shape your commitment to service, and communicate your values. You’ll understand clearly when it’s necessary to make sacrifices and when to stand your ground. By closely examining the strengths of pivotal leaders like Nelson Mandela, Oprah Winfrey, J.K. Rowling and Steve Jobs, you will gain a grasp of how these leaders rose to prominence, ignited passion in the masses, captivated the common imagination, and overcame the most exacting challenges to leave a legacy for our time. And the best part is, you can do it too! What Is A Leader will help you gain a clear understanding of yourself, define your vision, and shape your own personal profile of leadership. ABOUT THE AUTHOR: Laugh while you learn! 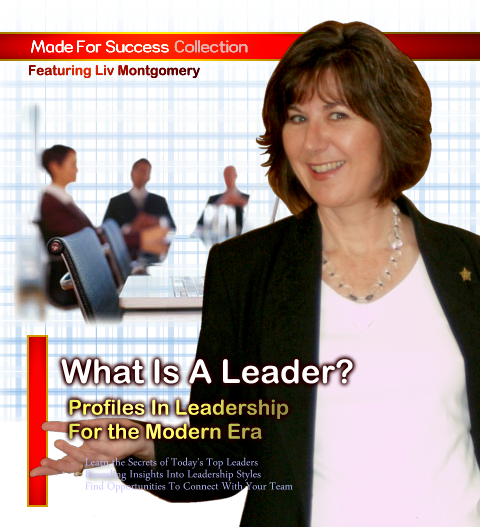 Liv Montgomery takes a fun, entertaining approach to communication, mind power and motivation for today’s busy business person. By distilling the magic of multiple disciplines into what she calls Edutainment, Liv has spent more than a decade developing the proprietary training methods she uses to produce quantum results with her clients in business and life. Liv’s background in big-time marketing and media production – combined with her experience as a certified Life Coach, Hypnotherapist and NLP Practitioner – creates a unique chemistry that’s like rocket fuel for the mind.